UBS Country Head, Poland. Michal has over 15 years of leadership experience. 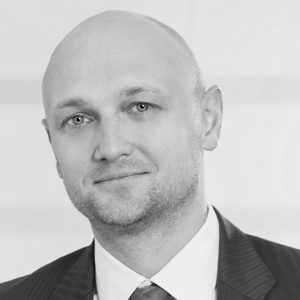 Prior to joining UBS, he worked in both Polish and international companies, where he was responsible for legal, risk and compliance matters of regional and cross-regional departments. In UBS, before becoming Country Head in 2017, he was a General Manager for UBS Business Solutions Center in Krakow and before that held positions of COO, IT Service Delivery Head, Legal & Compliance Head and Service Delivery Head – Deputy CEO. Michal is qualified Attorney in Law. His areas of expertise include: the business services sector, process excellence and executing standards. He is a Management Board Member of Swiss Chamber of Commerce.